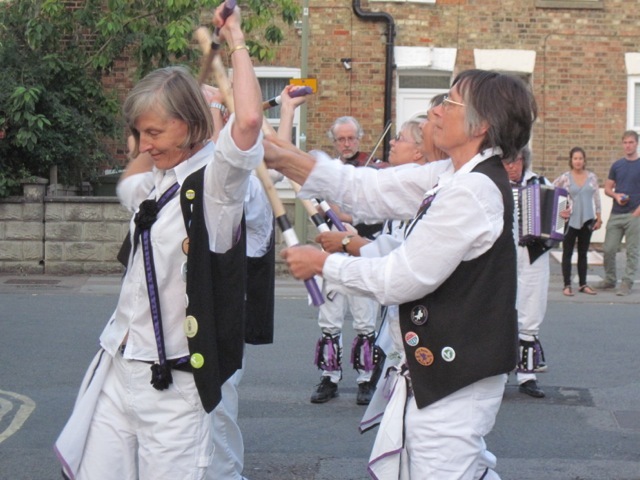 The worryingly good summer of 2014 produced another fine evening for our last regular dance out of the season on the last day of July. We were close to home ground at the Kite in Mill Street, Oxford. Not quite Botley, but just off the Botley Road. Another fine summer evening at the Kite, Mill Street. It was a significant day for several reasons. It was Isobel’s birthday. It was the day Mick the Drummer retired – from work, not Havoc, he was quick to point out. And, sadly, it was Clare’s last dance out with us. She’s been a stalwart of the side for the last 8 years, but she and her husband are relocating to the Lake District. Which is a bit of the long way to come for practice. She joined Havoc at the same time as your humble scribe, and we’ve spent many many dances lurking together at the back of the set. Clare offers Charlotte her overhead during Lads Aʼ Buncham at the Kite. 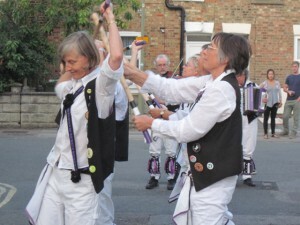 Clare is a fine dancer, and we’ll all have to practice like mad over the winter to make up for her absence. Outgoing Squire Pete must have decided to make the most of his remaining outings as Squire. He worked us hard all evening, and we ended up doing 16 dances, several of which we hadn’t danced since practice in March. We were rather rusty, and had to concentrate hard. 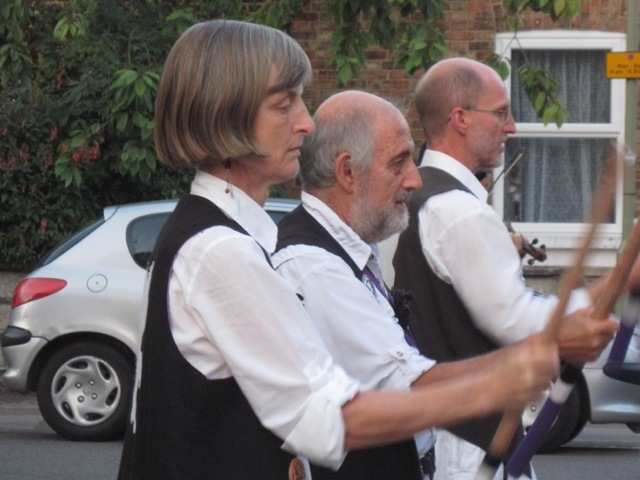 Clare, Steve and Pete all concentrating hard. When did we last do this dance? 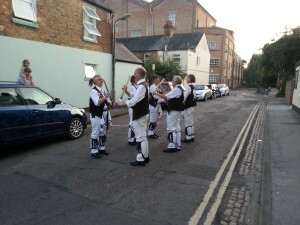 This entry was posted in Dance Outs on August 3, 2014 by Jim Hague.